This past weekend, we rallied the troops and took a somewhat impromptu trip to Animal Care & Control to meet a dog there at the behest of one of our rescue friends. She had spent some time with a dog there named Sarita, and just adored her. But her rescue didn’t have space accommodate her, so she needed someone else to help Sarita if they could. That’s where we come in. Meet Bully Project‘s new rescue, Baci! Baci’s another one of those dogs with a great temperament. 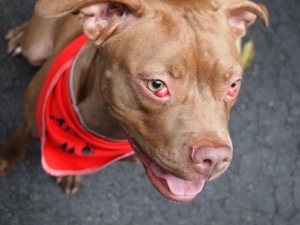 She loves people, loves to play with toys (and give them up when she’s asked), loves to play with other dogs and is unfazed by all of the distractions and craziness of the city. 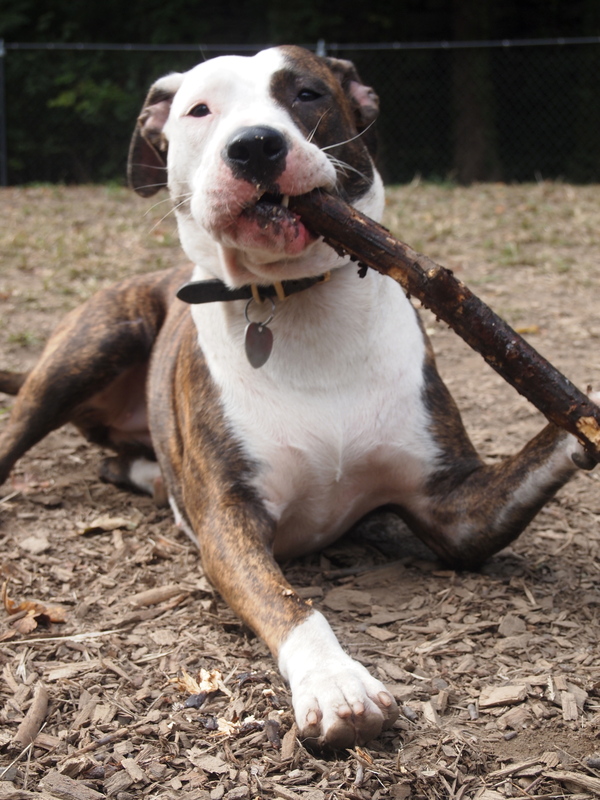 Baci is a “starter dog”: good for anyone from first time dog owners to experienced ones. As you can see, Baci has double cherry eye, an inflammation of the glands just inside the eyes. On top of that, she also has kennel cough. So right now, she is living at a veterinary hospital in isolation so that she can recover from the kennel cough and not infect any other animals. Once she’s recovered from that, we will perform surgery to correct the cherry eyes and have her spayed at the same time. 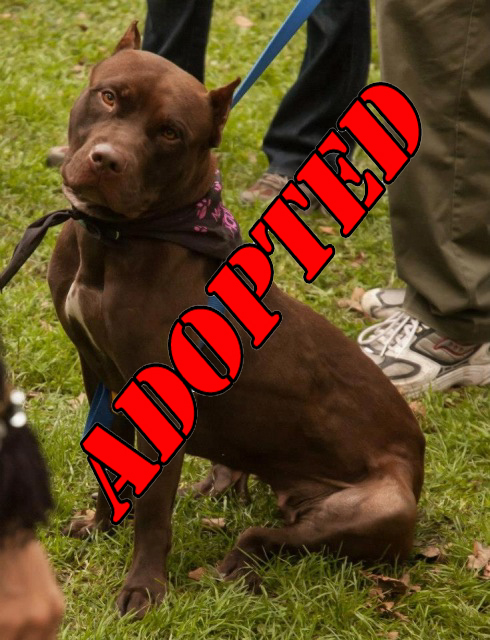 Once both conditions have subsided, Baci will officially be available for adoption. Baci is about one and a half years old and weigh about 45 lbs. She’s fully grown and has the perfect energy level for any kind of home: she loves to play but when we ask her to settle down, she obeys and calms down very easily. She already knows several commands including sit, shake with both paws, and down and seems to be house broken and crate trained. She is also already fully vaccinated and microchipped. So literally the moment she comes out of surgery, she will be ready to go to a new forever home. 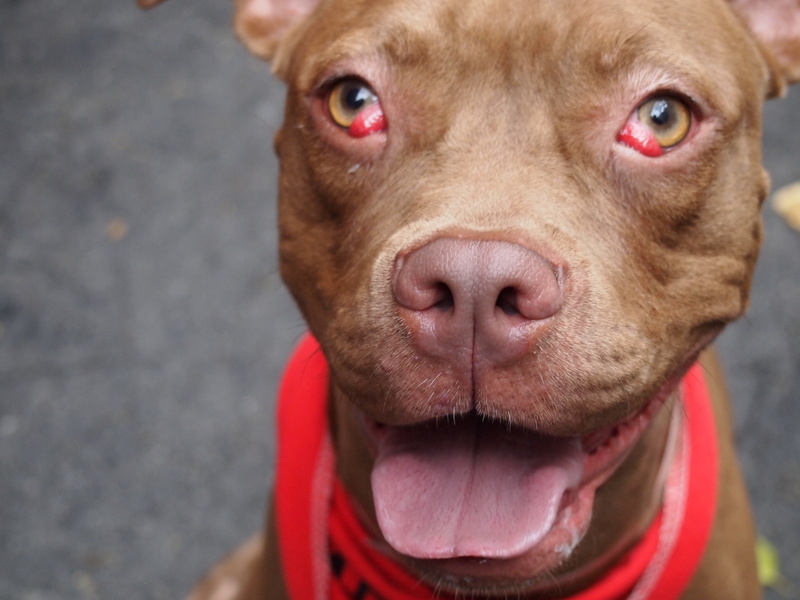 But we do need your help: the surgery to correct Baci’s cherry eyes will not be cheap. Neither will the costs for the isolation boarding at the vet’s office. If you can, please consider making a donation online at bullyproject.org to help us cover some of Baci’s medical costs so that she can get into a home as quickly as possible. And of course, if you or anyone you know might be interested in having a wonderful new dog like Baci, please email us at bullyprojectnyc@gmail.com. It’s finally time to play this month’s “What’s In My BarkBox?” What with all the excitement of Ethel getting adopted and then Toasty getting adopted, everything else sort of got put on hold. But that doesn’t mean we weren’t happy with this month’s BarkBox. Au contraire! We were THRILLED! After seeing what we got this month, you may just want to join up yourselves, and you can do so here and get $5 off your first subscription. First up, we got some great treats from Feelgood Treat Company. These Turkey Trail Blazin’ Bitz are great for almost all dogs as they’re all organic and natural, and are also wheat, gluten and preservative-free! Since Lucy is allergic to all things poultry, these are staying in my office for all the four legged critters that come in to visit. Next up, we got a beautiful, handmade toy from Lollycadoodle. I think these toys are so fun and dynamic and pretty darn cute. And Lucy seems to love it, too, as she hasn’t been able to stop twirling it around! And on top of that, it’s great for terrifying those ophidiophobic friends and colleagues! Our next goodie is a necessity for dog owners everywhere, but especially here in NYC. Poopy packs from Metro Paws! But fancy poopy packs that match Lucy’s Sirius Republic orange argyle collar and leash! To help care for Lucy’s pearly-whites, we got a product we’ve never seen before: Tropiclean‘s Clean Teeth Gel. We haven’t gotten the opportunity to use this yet, but we’re wondering if any of you have used something like this? Do you find it helpful? Lucy’s generally pretty tolerant of teeth brushing, but if this is even easier, we’ll certainly work it in! Next to last, we got a discount card for canine prescription medications from Honest Discounts. I’m not quite sure how much use we’ll get out of this since our prescriptions come directly from our vet, but it’s good to have around just in case! And last, but most definitely not least, we got something we’ve been yearning for for quite a long time! 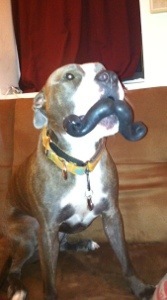 Moody Pet‘s Humunga Stache! How can you resist? Sign up for BarkBox and join in on the fun! It truly does take a village to rescue a dog! 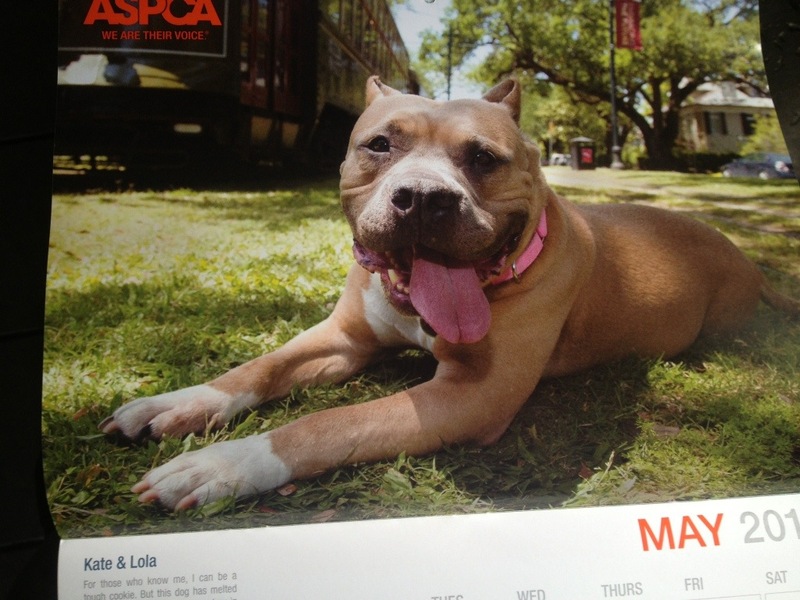 We learned this early this year when Our Waldo Bungie helped to save a beautiful pittie girl named Kimba. But we learned it again first hand as Bully Project‘s Toasty went from shelter dog to beloved family pet in just under three weeks. 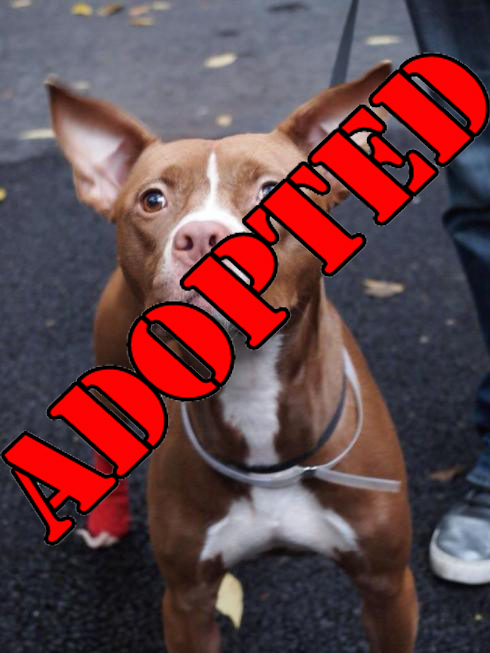 That’s right, folks: Toasty is adopted! 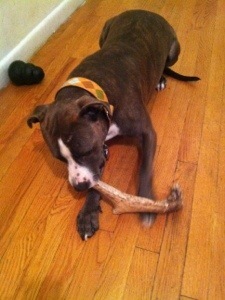 Nearly a month ago, we got an email from our good friend Mazzie’s mom from Mazzie Takes Manhattan. 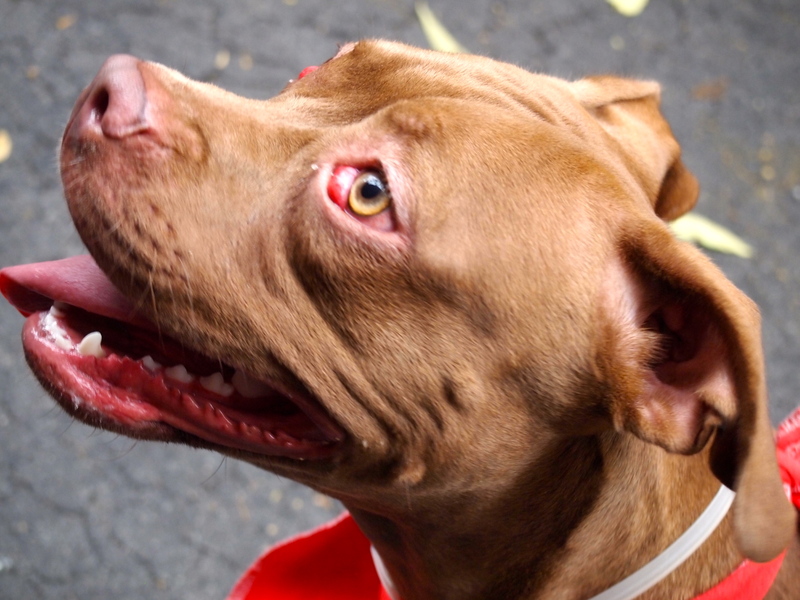 She had seen a pocket pittie named Nena at an Animal Care & Control adoption event hosted by Fenwick Keats, a real estate agency in her neighborhood. She just couldn’t get Nena out of her head, and the thought of Nena languishing in the shelter was too much for her. “Would Bully Project be willing to rescue her?” she asked. We couldn’t say yes without meeting Nena first, so off we went to ACC. And after just a few minutes of hanging out with Nena, we knew she deserved much more than spending her remaining days (however many there were) at the public shelter. So we made all the arrangements, and went out to celebrate our newest rescue at nearby restaurant called Toast – which became our new girl’s namsake, as we renamed her Toasty. 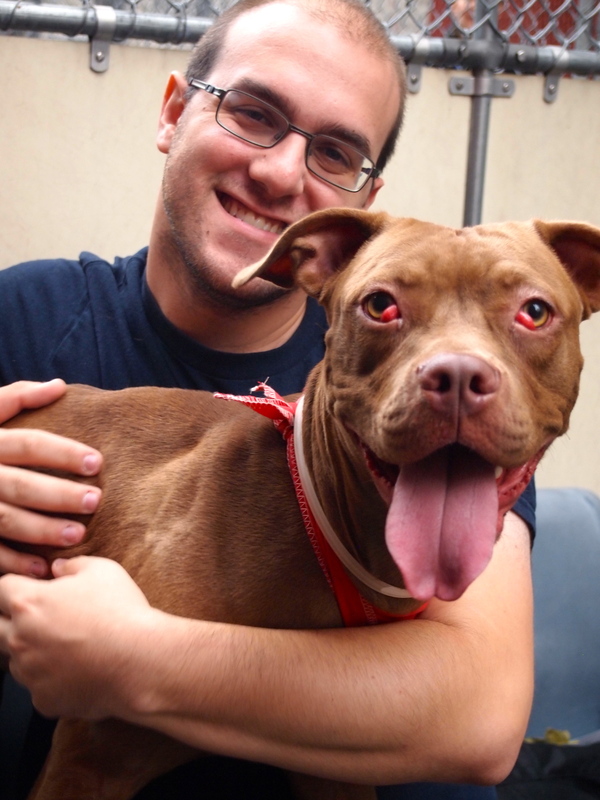 The next day, Mazzie’s mom went to collect Toasty from the shelter and transport her to her new digs at West Village Veterinary Hospital, where Toasty would be put in isolation to recover from her kennel cough. While there, Toasty got the royal treatment: attention from the vet techs, daily walks from Mazzie’s mom, her assistant and close friends, close medical care and tons of love. She won over the entire staff very quickly, with one of the vet techs even making a personal call to a friend of hers who she knew was looking to adopt a new dog. This friend lived in Massachusetts though. Would they want to come all the way to New York just to meet a dog that they may not even like upon meeting her? Well, thanks to videos and photos taken by the staff of the vet hospital, the family was convinced that Toasty was worth the effort. We made arrangements for the potential adopters to come down to New York as soon as they could while we also made arrangements for Toasty’s new temporary home now that she was back to full health. Mazzie’s mom to the rescue again: she transported our girl to a beautiful, state-of-the-art daycare facility called Hounds on the Hudson. And yet again, Toasty won the hearts of everyone there and got the ultimate in doggy vacation experiences. And then the big day came. Mazzie’s mom came with us to meet the family and introduce them to Toasty. And you can guess what happened next! We’re so grateful to everyone who helped made this story happen, as the outcome would not have been possible without everyone’s full participation. To the staffs of Fenwick Keats, West Village Veterinary Hospital and Hounds on the Hudson: thank you for supporting animal rescue. And most importantly, to Mazzie’s mom (who not only helped with every bit of this rescue but also fundraised enough money to cover Toasty’s expenses and then some): you are a beacon of hope and a true hero in this rescue community. We are eternally grateful to you. 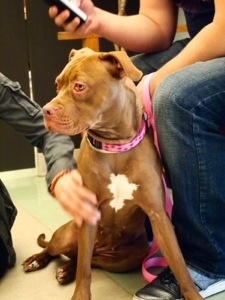 And to Bella: enjoy your beautiful new life! If you are interested in meeting any of the dogs at Animal Farm Foundation, please take a moment to fill out their adoption application.